Click HERE for link to purchase on Amazon. The book is a case of unexplained phenomena, including chemical evidence, that is an ultimate challenge to scientifically-minded skeptics. Forrest J Ackerman (1916-2008) was a world famous futurist, author and a pioneering promoter of science fiction books and films. As an atheist, Mr. Ackerman did not believe in life after death. However, he promised friends that if he were wrong, he would try to drop them a line. The is the unabridged true story of precisely what happened. For over six years, data has accumulated that Mr. Ackerman continues to communicate, with over 100 incidents that include physical chemical evidence studied at two universities. This has left top science professors in fields from chemistry to psychology completely baffled, and in some cases, plagued by unexplainable incidents themselves. The book includes Paul Davids' sworn personal testimony and incredible story of bizarre contacts from the mentor whose deep friendship he valued for half a century It also includes in-depth chemical analysis (a 3 year study) of an extraordinarily mysterious ink and ink message that continues to mystify scientists, and also studies from state of the art sensors used with computer software, apparently successfully, to attempt getting responses from spirits, including the late Mr. Ackerman. 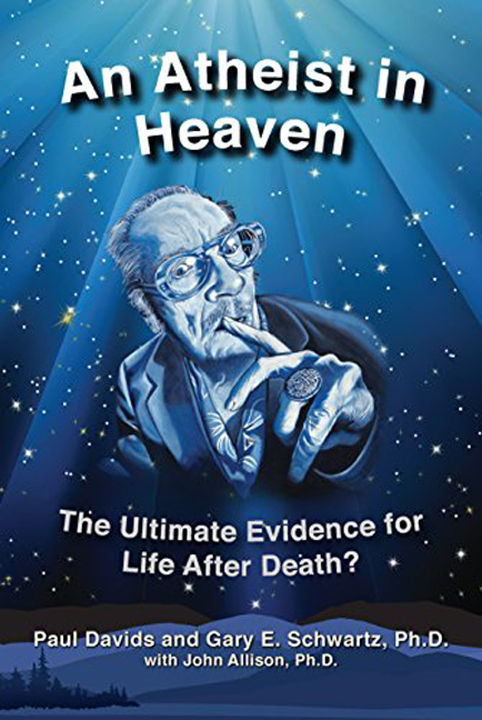 This is a companion work to Mr. Davids' feature documentary from NBCUniversal called "THE LIFE AFTER DEATH PROJECT," but a previous viewing of the film is not essential, and the book certainly stands alone. "An Atheist in Heaven" is available on Amazon. "Blowing America's Mins" is available on Amazon.